007 is back in this latest instalment of the Bond series by Electronic Arts. Dubbed Nightfire, this game was developed by Eurocom, the same group responsible for the Harry Potter and the Chamber of Secrets series out now, also from Electronic Arts. 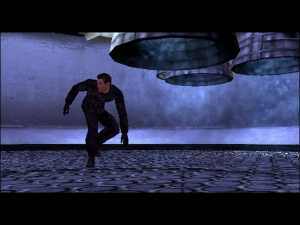 For quite some time the game to aspire to in the Bond Series has been Goldeneye for the Nintendo 64 developed by Rare. For five years no one has matched the game experience offered there and they still haven't reached that level of gameplay yet. Nightfire is the second best thing to that title however and the amount of sheer polish and gameplay options makes for a very cool gaming experience. Commencing with a very slick Full Motion Video and excellent music, Nightfire will immediately absorb players within the Bond universe with it's signature Bond music and of course the almost perfect digital replication of the Pierce Brosnan Bond. Combine that with awesome vehicles and weaponry, along with the usual hot Bond girls and there is a combination that can't go wrong. First let's start with controller setup. If you are not happy with the default configuration, then there are multiple options there to satisfy everyone. I personally found that the default controls were more than sufficient to get me through the game just fine. The aim of the game is simple as are the general objectives of most of the 007 movies: get the bad guy, get the girl and save the world. There are three main ways to achieve this and all are in keeping with the fine traditions of the 007 franchise. These are simply; first person shooting, driving and on rails shooting. We will now cover these elements in more detail so you know what you are getting yourself into. For starters the real cream of the title is the first person shooting element. The controls as I have mentioned are excellently set up and also very responsive to the commands of the player. There are two aiming types, auto aim and manual aim. The auto aim is not a dummied version and you really have to be close to hitting them before it guides the rest of the way. I found myself switching between the two for the sake of this review, however would most likely use the manual option to make things a bit harder for myself if just playing the game normally. The weapons used in the game are varied as are all of the obligatory Bond gadgets. I especially admired the easy way you could switch from one item to the next by using the D pad. Left/Right was for weapons and Up/Down was for gadgets. 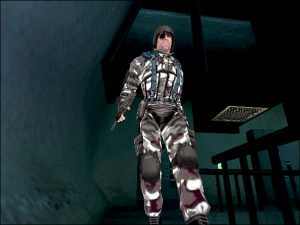 There are various fire modes for each weapon and unlike Agent Under Fire, there is not a dummy system that holds your hand when using gadgets. I found it slightly annoying how it so obviously told you what to do. Nightfire is greatly improved in that regard also. The animations for enemies are smooth and realistic as is their general contact with the game world around them. Good voice acting has been provided for many of the characters and they will call out when they see you etc. Then we have the driving levels. For the most part you will be guided through these levels by a series of objective related tasks that are pretty lenient and linear. The cars and the way they handle are good and in general they are a lot of fun. They also break up the intensity of the shooter levels which I found took a bit away from them as they were distracting. There were also a number of levels where movement was restricted as I was travelling in a vehicle being driven by someone else or in the snow levels on a gondola on a rail. In these levels all you can do is sit back and shoot at whatever moves. I liked when I had to use a guided missile to take down an attack helicopter. When fired, your point of view was the missile and you had to literally guide the missile into the target. Good stuff. The thing to remember about this game is that it is a completely original storyline for this title only and the level of quality is brilliant, with all the plot twists, thrills and spills that are present in one of the movies. In fact the opener and all the cutscenes in the game are fantastic and do the license justice. When playing the game you will feel that you really are James Bond going through his paces. This game also looks very good with a smooth framerate for the PS2 with varied textures helping draw you into the game world. Despite effects such as rain and snow, I didn't notice any slowdown at all which is a credit. 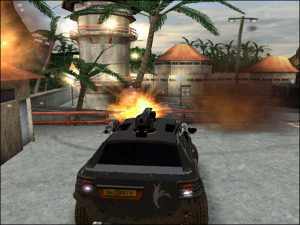 The game has a diverse multiplayer aspect to it as well with various modes that should keep players amused for some time. There was slight slowdown in multiplayer, however it was only that it seems the characters were not moving as fast as I would have wanted. 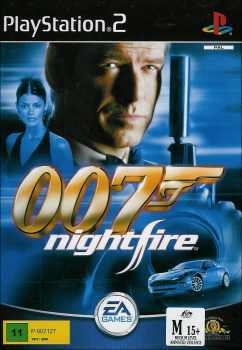 James Bond 007: Nightfire is a strong game for the Playstation 2 that truly makes you feel a part of the whole Bond experience. It is a little short (I finished it in 12 hours roughly), however the multiplayer ensures that it is value for money. I recommend this game.